The selection meeting for the August-October issue of Cast On was on the 12th. The Stitch Anatomy lesson is on cables and the Fashion Framework topic is mittens. There were lots of wonderful submissions. The issue will have many cabled sweaters which will perfect for the fall and winter. The initial proofs for the May-July issue was available. That issue features shawls--perfect for the summer. It was a quiet week. I reviewed a few Lesson 1 packets and one Lesson 3. I blame the weather! It has been beautiful here. The registration for the Mackinac Retreat closes soon. When I checked last, there were two spots available in my class. Penny Sitler, the Executive Director of TKGA showed me some of the items she has collected for the goody bags and door prizes. The companies in the industry have been very generous! I know the topics for the tips can seem fairly random. Things I see in the knitting I review and questions that come up in the TKGA group in Ravelry frequently determine what I pick. Several weeks ago, someone was curious about how to weave in yarn tails in seed stitch. (There is a seed stitch swatch in the Basics class and one in the Masters Program. Also the cable and lace swatches in Level 2 are bordered in seed stitch.) Keep in mind, that for projects which will be seamed, the tails can be woven into the seams. For projects which are not seamed (like swatches) this isn't an option. 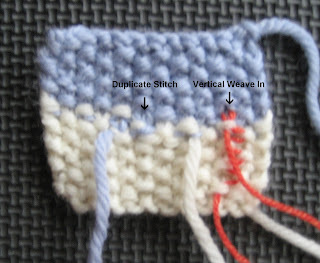 The duplicate stitch method requires that you follow the path of the yarn (or duplicate the stitch). This can be tough in seed stitch since there are both knit and purl stitches. 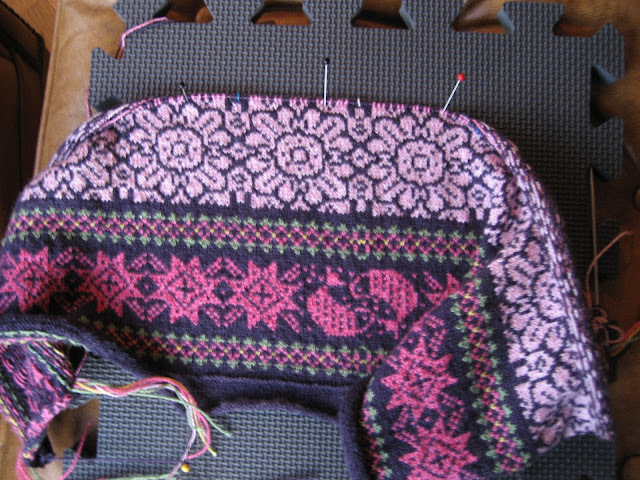 The duplicate stitch method is used in the center of the swatch. If the fabric will be reversible, use this method. It is less noticeable. By the way, unless you are doing intarsia, avoid mid-row joins. 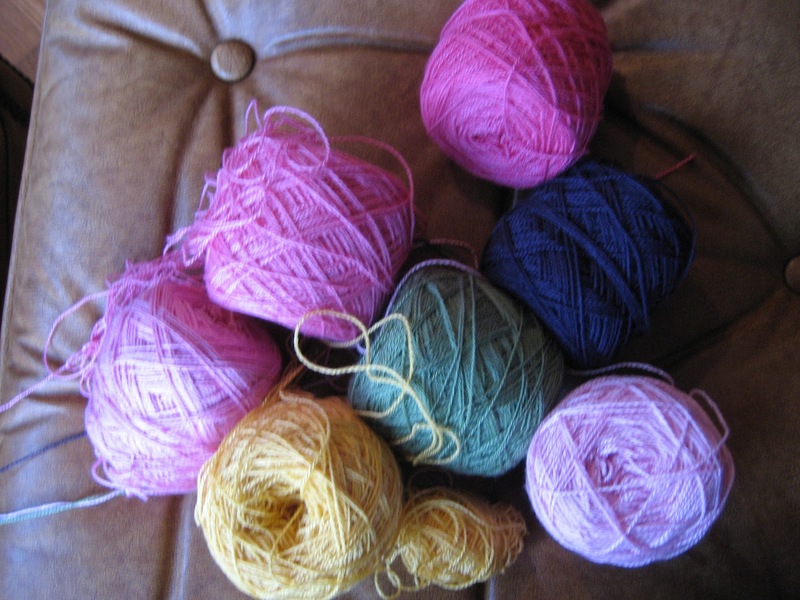 When you are nearing the end of a skein, don't continue using it until you only have six inches left. Start the new skein at the beginning of a row. The red yarn shows an alternate way of weaving in yarn tails for seed stitch. You can weave the yarn in vertically through two columns of purl bumps. Don't run the yarn up one column of stitches. The tail is less likely to pull free if you use two columns. Also if the fabric is stretched lengthwise, it won't cause a pucker. I always "anchor" the tail by working one duplicate stitch at the end. This method is more visible on the WS of the work and therefore should only be used when there is definitely a RS and WS. The video shows both techniques. If the seed stitch is very loose (lots of holes between stitches) the vertical method is not ideal. The duplicate stitch method should be used. I check the paper this morning to see what time UK plays on Saturday. It is TBA so I went ahead and scheduled the salon for Saturday. If the game is on, I will have the game on (sound off). Saturday is a busy day. In addition to the NCAA tournament, the St. Patrick's Day parade is Saturday afternoon and the Sweet Sixteen Tournament (KY high schools) finishes up. I finished up all of the birthday projects. When I finish up the Cast On projects, I'm sending this pattern off to Miss Babs. 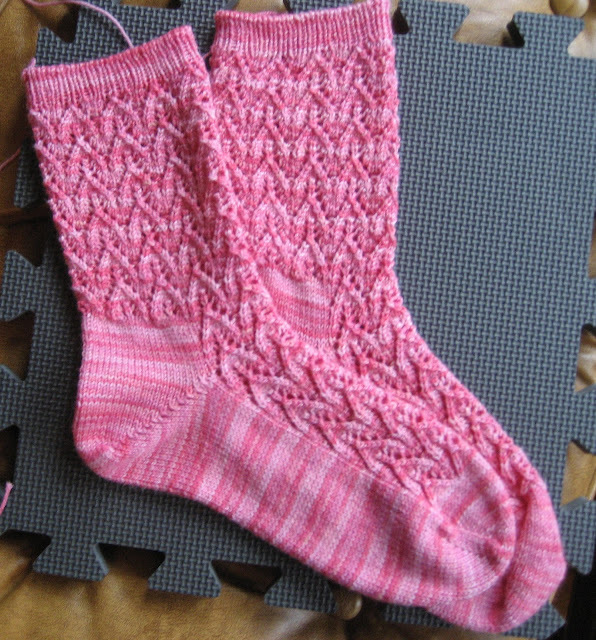 The socks are fun to knit but there are quite a few ends to weave in! I really like Lorna's Lace Solemate. It is wonderful to work with. 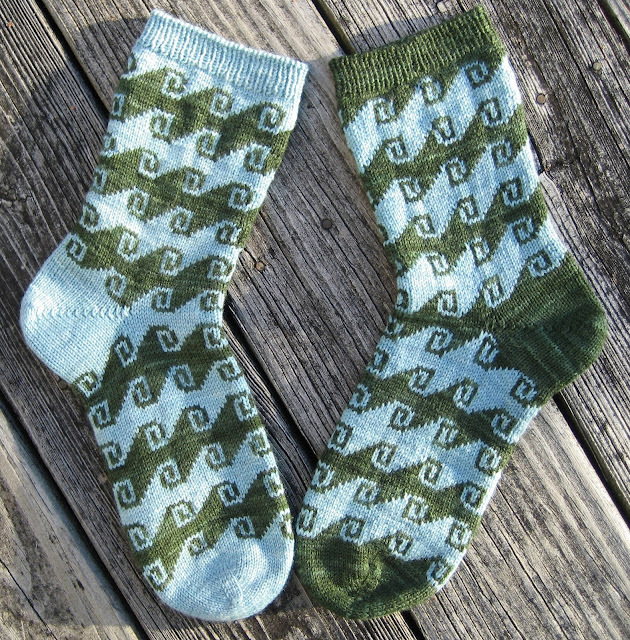 I used the arrowhead lace pattern for the socks. It is a very stretchy pattern. This is the bottom border. In all of the sweaters in this series, I include a nod to the next season. The summer sweater (to be done next year) is inspired by the night sky in the Uinta mountains where my husband fly fishes. The border is stars with two fish at the center. (There is a folded hem.) Now I am working on the floral design. There are four shades of pink. The darkest shade will be used only in the borders. The other three shades will alternate in the floral pattern.